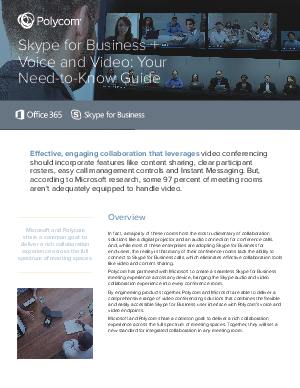 Polycom has partnered with Microsoft to create a seamless Skype for Business meeting experience across any device, bringing the Skype audio and video collaboration experience into every conference room. By engineering products together, Polycom and Microsoft are able to deliver a comprehensive range of video conferencing solutions that combines the flexible and easily accessible Skype for Business user interface with Polycom’s voice and video endpoints. Microsoft and Polycom share a common goal: to deliver a rich collaboration experience across the full spectrum of meeting spaces. Together, they will set a new standard for integrated collaboration in any meeting room.